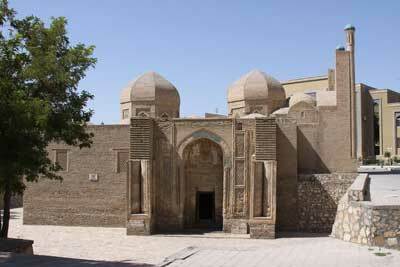 The Samanids Mausoleum is the oldest Bukhara's structure, which remained intact to the present day. It was built in the late 9th – early 10th centuries for Ahmed ibn Asad by order of his son Amir Ismail Samani, the founder of the first centralized state in Central Asia. Later he himself was interred in the mausoleum. 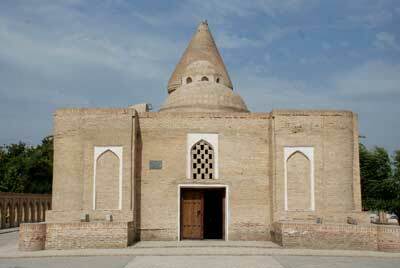 Chashma-Ayub Mausoleum is located near the Samanids Mausoleum, by the ruins of an ancient fort. 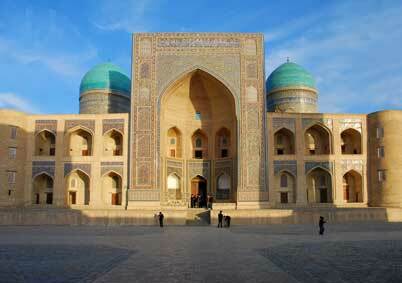 The pointed silhouette of its hipped roof looks conspicuous among the domes of Bukhara mosques and madrassahs. This mazar – burial ground appeared in the 12th century beside the spring that is associated with the biblical prophet Job, called Ayub in Asia. Friday-prayer Kalyan Mosque is one of the ancient buildings of Poi-Kalyan Square. The chief mosque of any Muslim town is not just a temple but is also a public life center. 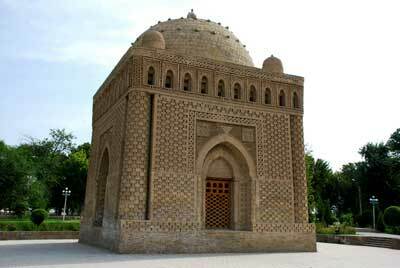 But Bukhara's chief Friday-prayer mosque, which was built after Islam had been established in the town, had really no luck. It was repeatedly relocated, a couple of times its roof collapsed, killing the praying people inside. On approaching Bukhara, travelers can see far in the distance Kalayn Minaret, towering over hardly noticeable buildings of Bukhara. 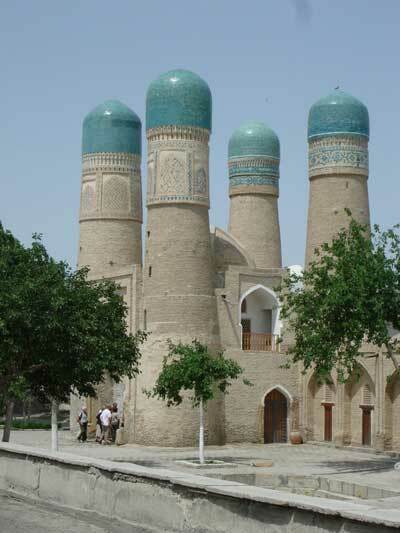 In the Middle Ages the caravans that traveled hundreds of miles along the Great Silk Road used the minaret as a landmark, which is natural enough as the word 'minaret' is derived from Arabic minora, meaning 'lighthouse'. In wartime, from the top of the minaret the guards watched the movements of the enemies in the vicinity of the town. Among the large number of the madrassahs built in Bukhara in the 16th century Miri-Arab Madrassah stands out as a real masterpiece. It was built on an elevated platform right across from the Kalyan Mosque. This architectural technique, called kosh ('coupled'), was quite common in the Middle Ages. 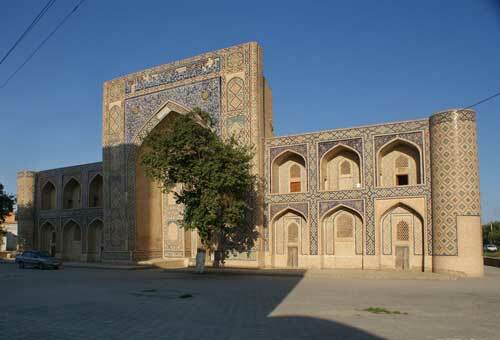 Among the large number of Bukhara's monuments Chor-Minor Madrassah stands out for its extraordinary design. Its four minarets, standing very close to each other; look from afar like buds of mysterious azure flowers. At closer survey they appear to be tall and strong towers, illusively “pressing” a domed cubical building. The entrance to the madrassah has a tall portal. Similar portal once decorated the exit to the courtyard of the madrassah. Inside Chor-Minor there is a writing in Persian, carved in two-color gunch-stucco; it shows the time the construction of the building was completed in the year of the Hijjra 1222 (1807 by modern calendar). In Central Asia the architectural principles of a madrassah construction were developed as far back as the Middle Ages, and up to the 20th century the local architects had stuck to these directives. However, the principles were broken during the construction of Chor-Minor Madrassah, for the constructors had to comply with the wishes and instructions of Caliph Niyazkul, who financed the project. To the south-west from Ark, on the ancient Khiyobon street, which once ran to the city gate Shir-Garon, stands the architectural complex Kosh-madrassah, consisting of two madrassahs whose facades are located on the same line. Kosh means 'coupled'. This architectural design was frequently used in Asia in the Middle Ages. The Kosh-Madrassah complex consists of two madrassahs. 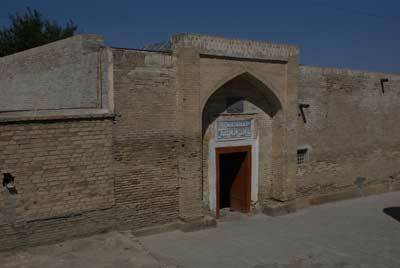 Twenty-three years after the completion of Modari-Khan Madrassah in 1590 there was built Abdullakhan Madrassah. Its facade virtually resembles facade of Modari-Khan Madrassah standing across the street; only its huge peshtak portal towers over the surrounding structures. 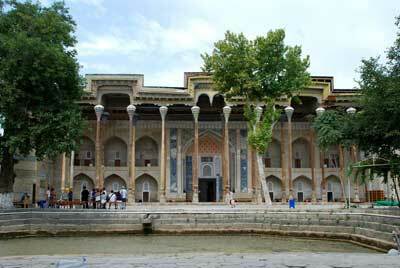 Amir Temur's son Mirzo Ulugbek, who ruled Movarounnahr in the first half of the 15th century, built three madrassahs. 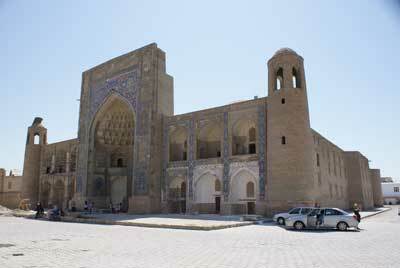 The first one was constructed in Bukhara in 1417. 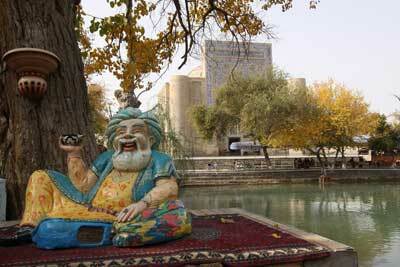 By that time Bukhara had been long since known as the capital of Islam theology. In the Orient at all times madrassahs were centers of science and education. 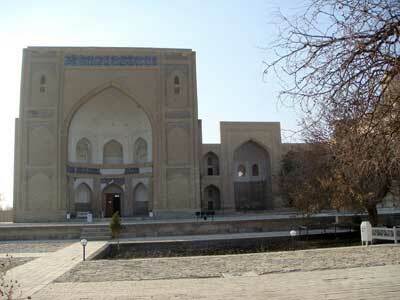 In 1652, opposite Ulugbek Madrassah, Bukhara's ruler Abdulazizkhan ordered to build in so called "kosh" technique a new madrassah, whose grandeur and luxury of decoration had to surpass all other madrassahs built before. 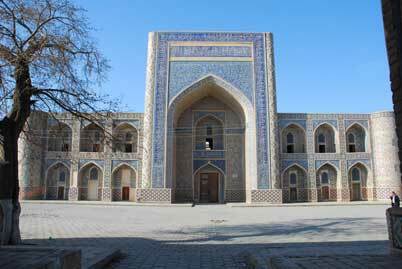 And indeed, though the general design of the madrassah followed the 15th century architectural canons, the great dimensions and rich decoration allowed this structure to be ranked with the most outstanding architectural monuments of Uzbekistan. 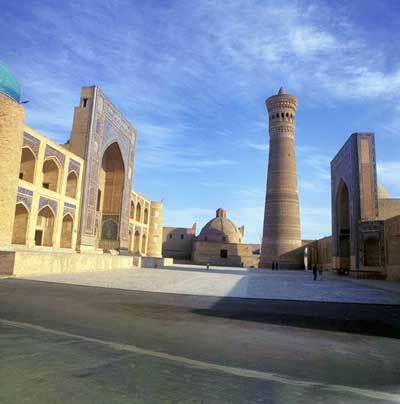 Lyabi-Hauz architectural complex is located in the centre of Bukhara and consists of three monumental edifices. The complex possesses a distinctive character: contrary to conventional traditions of making city square or street junction the centre of an architectural complex, it was constructed around a large hauz (pond). According to one of Bukhara ancient popular beliefs, if within one day a person manages to make pilgrimages to four mazars (graves) of the saints named Bakr, any wish of his will come true. That is why Chor-Bakr necropolis, which means 'four Bakrs', is so popular in the Islamic world. The necropolis grew around the much revered tomb of Abu Bakr Sayed in the village of Sumitan near Bukhara. 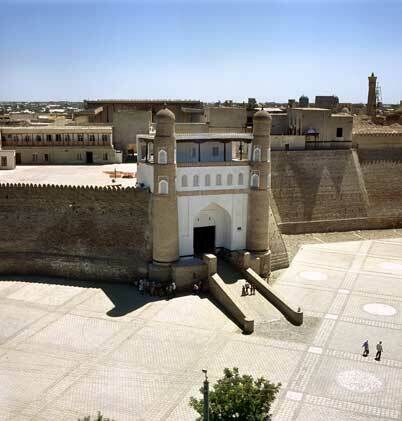 Of the numerous country palaces of Bukhara rulers there survived the best of them: Sitorai Mokhi-Khosa – the summer residence of the last Bukhara emirs. 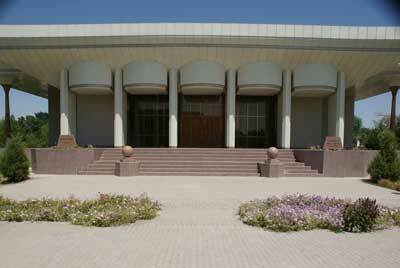 The palace is located at a distance of 4 kilometres north from Bukhara, by the road that runs to Gijduvan. 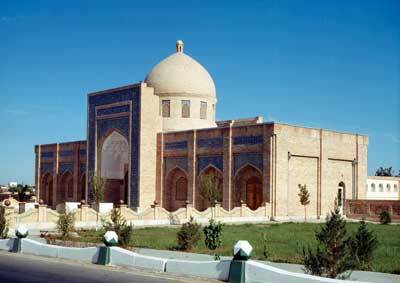 In the very center of the historical part of Bukhara there stands Magoki-Attori Mosque. Since the 16th century this building with two domes on faceted drums and a tall peshtak portal of the eastern facade has been known as a neighborhood mosque. The archeological excavations in the 1930s proved that the structure dates back to pre-Islamic time. It is a common practice that where there's a palace, there's a jail. 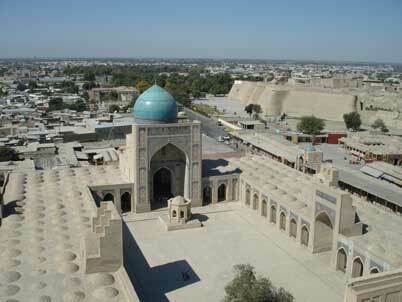 The Ark, a medieval citadel in Bukhara, is not an exception. Right behind its massive gates with a turret on either side is a gloomy roofed corridor, dalon, with 12 entrances to the cells prisoners used to languish in. At the end of the corridor there was Emir's throne-room and a reception hall for ceremonies. Actually, they were parts of a large brick-paved courtyard on three sides enclosed with ayvan platforms with wooden pillars. The marble throne of Emir stood at the far end of the courtyard. 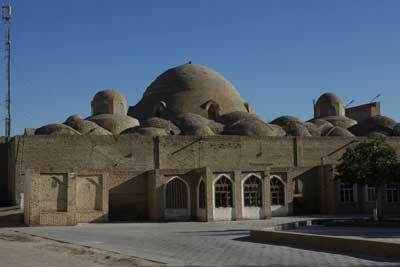 On the main streets of medieval Bukhara they used to build domed shopping arcades. Three of them, built in the 16th century, have survived to the present day. Toki Zargaron ('Dome of Jewelers') is located at the intersection of two arterial roads next to Kalyan Mosque and Miri-Arab Madrassah. Tok means 'an arch' or 'a vault'; this word was also used to call the street shopping arcades. In Asia trade has always been considered a respectable occupation. In Noble Bukhara there were always busy bazaars and the doors of the shops lining the streets stood invitingly open. Yet in the 16th century they also started to build in the town huge roofed shopping passages. Such a passage was called tim. One of them still exists. It is Abdullakhan Tim, named after its constructor, a ruler from the Sheibanids dynasty. 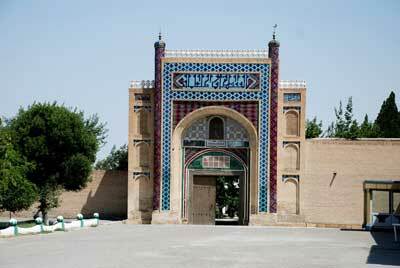 In the environs of Bukhara, there are many towns and villages whose age exceeds a thousand years. 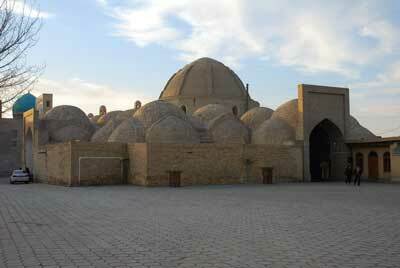 The village of Afshona located at a distance of a few kilometers from Bukhara is no exception. It is known that in 980 in this village, in the family of a tax collector, there was born a boy named Abu Ali Ibn Sino. The boy soon became a great scholar famous in both Asia and Europe where he is most commonly known by his Latinized name Avicenna. 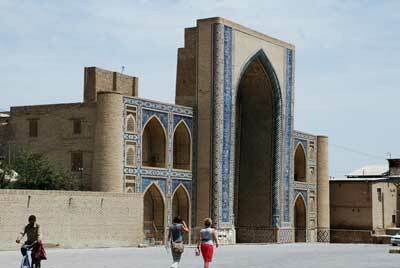 In Bukhara there survived some rather interesting monuments of the medieval civil architecture. Among them are oriental bathhouses – hamom. Built in the 16th century, under Emir Abdullakhan, they have deep-rooted traditions. Next to trading center Toki Sarrafon there is Hammomi-Sarrafon bathhouse, and not far away from Toki Telpakfurushon trading centre stands Hammomi Bozori-Kord bathhouse. 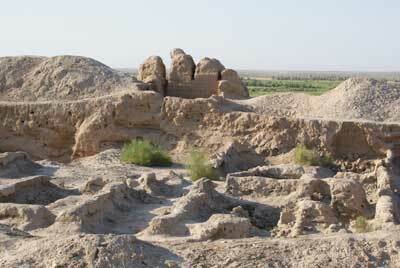 In Bukhara oasis today there are about 300 sites of ancient settlements and mounds, all covering up the remains of vanished towns and villages. Many of them are still waiting for their explorers, while some others, such as Varakhsha, Vardana and Paykend have been excavated and well studied, turning out to be real monuments to ancient civilizations.